If you are a fat man right now, do you think that you can become a fit man this year? Even worse, if you are a fat man over 45, 50 or even 60, the stakes are much higher than how you look in a suit. I am determined to find out. If you live in the USA, are a man and are over 20 years of age, there is a 74 percent chance that you are a fat man. And if you are a fat man over 50, you are literally risking your life. I know that sounds harsh, but those are the facts. Is it a big deal if you are a man and overweight or obese? Can you put your life at risk just because you are a few pounds overweight? Obesity is a risk factor for many diseases, cardiovascular being one of the most prevalent and fatal. Heart disease is the leading cause of death for men of most racial/ethnic groups in the United States, including African Americans, American Indians or Alaska Natives, Hispanics, and whites. For Asian American or Pacific Islander men, heart disease is second only to cancer. Even if you have no symptoms, you may still be at risk for heart disease. Unfortunately, obesity in men over 50 can lead to catastrophic results. Now that you know the facts, there is no reason to be sad. Your body is always trying to attain a state of health and fitness and we are going to help it along. That is the sole purpose of the Fat to Fit Man Plan. Get healthier and get fitter. High blood pressure, high LDL cholesterol, and smoking are key risk factors for heart disease. About half of Americans (49%) have at least one of these three risk factors. 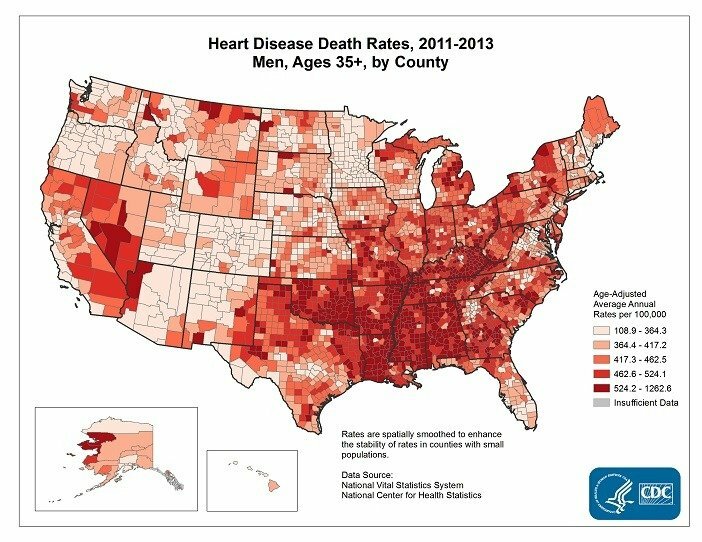 Take note of how the heart disease death rates in the first graphic appear to mirror the obesity rates in the second graphic above. This is the reason that overweight is such a big deal for men over 50. 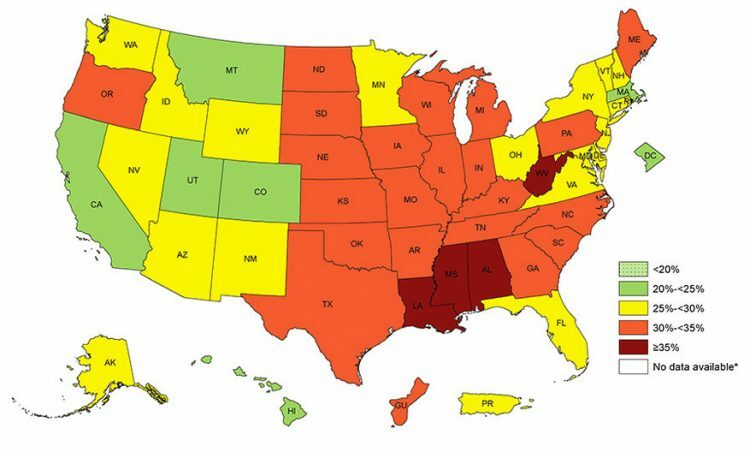 You can see yourself that most of the states that have the highest rates of obesity, those are the states with the highest rate of mortality from heart attacks. The good news though is that there are quite a few risk factors that you can control. Heart attack, coronary revascularization or sudden death before 55 years of age for your father or other male first degree relative. A heart attack, coronary revascularization or sudden death before age 65 for your mother or first degree female relative. Abnormal blood fat levels of LDL more than 130mg/dl or HDL less than 40mg/dl, or if you are on lipid lowering medication or a total cholesterol over 200 mg/dl. Systolic pressure of more than 140 and/or diastolic equal or more than 90. Not participating in at least 30 min of moderate intensity physical activity at least 5 days a week for at least 3 months. You cannot control age or family history. But you can control what you eat and if you move. Getting in the car, on the bus or train is not movement. If you can manage what you eat and your exercise, then you can reduce or eliminate the other risk factors. Being overweight or obese increases your risk of developing high blood pressure. In fact, your blood pressure rises as your body weight increases. You see that lowering your weight by even 1o pounds can help to reduce high blood pressure. “If you sit [inactive] most of the day, 5 or 10 minutes is going to be great,” Albright says. Can losing weight also help to lower your cholesterol? Now we can understand why people are so focused on losing weight. We know intuitively that a healthy weight is more likely to produce health. Just losing weight alone is going to help you avoid type 2 diabetes, hypertension, high cholesterol and lack of physical activity. Once you are at a more comfortable weight, it will be much easier to move. If you are a man over 45, then you already have one risk factor for heart disease, the main killer of men. This is why getting your weight under control is so critical. Do not delay, let's start the Fat to Fit Man Plan today to tackle the problem of obesity. First, let's figure out your ideal weight. Fat to Fit Man Plan Ideal Weight Chart by Vertex42.com. Used with permission. Just find your height on the chart and you will know if you are overweight in most cases. Of course, if you are an athlete, then you might not be overweight, just very athletic and muscular. For example, an average man who is 6'2″ tall, you want to be between 167 pounds and 181 pounds for a normal range. Let's start by using the ideal weight table chart to see whether we are overweight or not. You should also measure your waist in inches and calculate your body mass index. Are you anywhere near your ideal weight? Wherever you are, please make a note and let's get started on the Fat to Fit Man Diet & Exercise Plan experiment. I am starting at 200.2 pounds, 47.5 pounds of fat, which is 23.8 % body fat. 55.6 percent water and a BMI of 25.9 which is officially overweight. Waist in inches at navel is 42 inches, completely relaxed. I have quite a bit of work to do. If you have been following along for the last year, you might be seeing similar results. Especially if you also started as a 200 pound man. As fate will have it, I no longer have the calendar where I marked my progress for 2017. Long time followers of Hashi Mashi know that I got sloppy with my weight loss several years ago. I stopped the daily weigh, which led to a 40 pound weight gain, after my initial 100 pound loss in 2012. The good news is that during 2017, I figured out what I could do that would help not only to lose weight, but to maintain the weight loss for the long haul. Following this Fat to Fit Man Training Plan, I took off 30 pounds in 3 months. And I have maintained that weight loss till today. So I have updated this training plan to reflect the best practices which can help you do the same. In any case, if you are a first time visitor and are feeling or looking like a fat man, read on. Just take a look in the mirror or at a photograph. The picture you have in your mind of how you look, is not the image you see in the mirror. You have a picture in your mind of how you looked in high school, or on your driver's license. How old is that picture on your driver's license? The goal of the Fat to Fit Man Training Plan is to get you closer to that image of yourself in your mind. You want to get healthier and you want to get fitter. Of course, the Fat to Fit Man Training Plan will work for men under 50 as well, and women too. However, men over 50 have more built in risk factors for compromised health than younger men or even older women. Men are notorious for burning the candle at both ends. Working late in the office, chowing down fast food and relaxing by watching sports and drinking up a bit too much. Yes, not all men are swigging beer on the weekend, but the fact is that 74% of men in the United States are either overweight or obese. So, no matter what shape you are in now, do not give up. I know it seems impossible to take off 20, 30, 50 or even 100 pounds without starving yourself. But that is not accurate. This Fat to Fit Man Training Plan can help you reach your ideal weight, no matter how much weight you need to lose. The Fat to Fit Man Training Plan is called a training plan for a reason. How often have you gone to workout? How many years have you gone to the gym to workout and still are the same weight? Or worse, did you get even fatter? So what is the point of going to the gym to workout if you do not see results? A workout has no specific goal in mind. Sure, you said last year that you wanted to lose 20 pounds and have ripped abs for the summer. But you worked out , right? You went to the gym and did your standard 3 sets of 8, 10 or 12 reps.
You hopped on the treadmill for a cardio workout. But you are the same weight or more. A training plan is different. When you train, you train like an athlete, towards a specific goal. Just like an athlete, you need to use the overload principle to explode your fitness beyond what you think possible. So, no matter what we do exercise wise, effective nutrition is the foundation of getting healthier and fitter. Having said that, let's focus on some principles of Fat to Fit Man Plan nutrition. Start eating vegetables, at every meal. This means, for example, sautéed tomato, onion, pepper and mushroom with your eggs in the morning. Or, a salad in the afternoon with turkey, olives and a pickle. Or, sautéed broccoli with tofu in the evening. The point is to eat more vegetables than you are used to. Instead of eating bread, pasta, beans or potatoes, think vegetables. You know what junk is, snickers, ben and jerry's , Oreos, processed foods. Stop drinking calories like soda and beer. Keep it real, eat as much real food as possible, with a focus on vegetables, raw and cooked and lean protein, such as eggs, fish and/or tofu. Snack on almonds or berries. Drink water and/or green tea. Yes, we are keeping carbs, especially processed carbs low. Since we are overweight, there is a very good chance that we have insulin resistance. Insulin resistance is the inability of our bodies to respond to insulin. The problem with that is glucose will build up in our blood and instead of being deposited in our muscles as glycogen, the glucose will be sent to our fat cells. So, we live in a vicious circle, the fatter we are, the more insulin resistant, and the more insulin resistant, the fatter we get. The answer is for us to minimize the amount of glucose that will be in our blood stream. We do that by focusing on vegetables. This is not rocket science, we have known since ancient times that vegetables are the powerhouses of nutrition for the human being. At some point, once we have reached our ideal weight and waist size, perhaps we can add in some more natural carbs like sweet potato for example. But if you think that once you reach your ideal weight, you can go back to cinnamon buns every day, fuggedaboutit! Sautéed tomato, onion, mushrooms and spinach in extra virgin olive oil. One whole egg and two egg whites. Spinach, tomato, olives, onion with roasted turkey on rye, whole wheat or ezekiel bread. By the way, I did not invent the basic sequence of these upper body and lower body workouts. My inspiration is Nick Mitchell , the founder of Ultimate Performance Fitness with two personal training gyms in London (upfitness.co.uk), one of the world's leading body transformation experts. Chin-ups – 4 sets of 5 chin-ups using 85 pounds assistance on the machine. Use whatever weight assistance or body weight that is comfortable for you. The idea here is not to use the most weight possible. The point is to exercise your muscles against resistance so that they start to grow. The chin-up with a close grip is going to primarily work multiple joints during the exercise. Your elbow joint, which will be doing flexion. And your shoulder joint doing extension. Do the chin-up motion slowly and smoothly. Rest between chin-ups for 1 minute to 90 seconds max. If you need a chin-up bar, try out Gronk Fitness , or a Bossyn doorway chin up bar. Another great option is a Firstlas Fitness chin up bar that mounts on your I-beam, make the most of your basement. The incline bench press is going to exercise your elbow and shoulder joints again as the bench press is a multi joint exercise. However, instead of doing flexion with your elbow, you will be doing extension. And because you are going to do the incline bench press with a wide grip, you will be doing horizontal shoulder abduction and flexion. Do 4 sets of 8 repetitions. Make sure you use a weight that is comfortable so you can use the best form possible. I started with the 45lb bar for the first set of 8. Then 65lbs for the second set of 8. 75lbs for the third set of 8. 75lbs for the fourth set of 8 incline bench presses. Deadlifts are great for fat loss. You can either use dumbbells or a barbell. Start with the 45lb barbell and 2 10 pound plates on either side. If you have access to a gym, you can usually find larger 10 pound plates. This is useful so you do not have to go down so low to the floor when returning the weight on the deadlift to the floor. 85 pounds for 8 deadlifts. Each set has one minute rest. For motivation and inspiration, read about the incredible benefits of deadlifts. The joint movements exercised on the deadlift are your hips, knees and ankles. Specifically, ankle plantar extension, knee extension and hip extension. Get up on the dip bar, and using your body weight or assistance, do 4 sets of 8 dips. I used 65 pounds of assistance today. Lower your body till your triceps are parallel to the floor. But, do not force yourself into a position that is uncomfortable. The joints that you exercise with the dip are your elbows, for elbow extension. And your shoulders, will be doing shoulder extension. Rest one minute in between each set. Use a bar, start with a light weight, and lift the bar up to your chin from your hips. I started with 35 pounds. Do 4 sets of 8 with 1 minute rest in between sets. The joints exercised here are elbow flexion and shoulder abduction and flexion. Do a plank on your elbows and touch your toes to the outside and back in. Do 10 repetitions using each leg. This exercise will use your spine, for spinal flexion, so it is a multi-joint exercise. In addition, you will be doing hip abduction. Do 2 sets of 10 pushups with a minute in between sets. You should be pretty tired at this point, even if you did not use maximum weights. Select a type of cardio exercise that you enjoy. You want to get in at least 30 minutes for 5 times a week, to conform with the national recommendation of 150 minutes of moderate-intensity exercise. Warm up for several minutes, and then build up your speed every minute. I chose the elliptical because I have access to one in my building, and I like it more than the treadmill. Instead of going at one pace, mix it up and do some high intensity interval training. What is so good about HIIT, read more about it here. I aim for 2 miles within 30 minutes, which seems to be a reasonable rate at this point. If you made it through day one, then give yourself a pat on the back. I know that was not so easy, especially losing the bread, pasta and donuts. That is not easy for anyone raised on a processed food diet. And it gets harder every day we are overweight and insulin resistant. Good job. So, take a shower, have a green tea and get ready for tomorrow. Start the day off with a tall glass of green tea and lemon. If you live in New York or many other places in the country, you need something hot. Today it is 15 degrees in New York City. Sautéed tomato, onion, mushrooms and spinach in extra virgin olive oil, with coriander and cumin. Spinach, tomato, olives, onion pickle with roasted turkey. Stick with the Fat to Fit Man Plan so you can get healthier and fitter. If you are not feeling a little sore in your upper body today, then you did not workout with enough intensity yesterday. But, no worries, there is no rush, let's keep building good habits. Do 4 sets of 8 squats. If you need a reminder of how to squat form, read this primer on perfecting your squat form, especially when you are over 50. The squat is an unbelievably effective exercise. Squats are a multi-joint exercise. The squat requires ankle extension, knee extension and hip extension. Not to mention so many , if not the majority of the muscles of your body, your largest muscles. If you have a half hour to spend in the gym, what would you rather focus on? A single joint exercise like biceps curls, with most of the stress on the small bicep muscle, or the squat, which exercises your entire body? If you want to read about the great benefits of squats, check out this article here. Rest about one minute to 90 seconds in between squat sets. You need to record the weights that you used. So, if for example you used the bar only for the first set, and 55 pounds for the next 3 sets, make a note of it. Do 4 sets of 8 lying leg hamstring curls. Notice that the squat requires ankle, knee and hip extension, a multi-joint exercise. Now, this is followed up with a single joint exercise, the lying leg hamstring curl. This exercise focuses on knee flexion, as opposed to the knee extension of the squat. Start with a light weight, and focus on form, so leave your ego at the gym door. If you are only using 37.5 lbs for all four sets, no worries! This exercise requires the incline back extension apparatus. In case you do not have one, you can substitute with the Superman back extension. Just lie face down on the floor and simultaneously lift up your arms and legs, just like superman did when he was flying around Manhattan. Do 4 sets of 8 back extension repetitions in the Superman position. The back extension is considered a multi-joint exercise. In this case, spinal extension. Do 4 sets of 12 calf raises. If you have access to a calf raise machine, use that if you like. Or else you can just do the calf raise standing with or without weights. The calf raise is a single joint exercise with the emphasis on ankle plantar extension. If you only use 10 pounds of weight in each hand for the calf raise, just make a note of it. Do 4 sets of 10 leg raises. If you are able to, use straight legs. Or, if you are not flexible enough, you can just raise your knees towards your chest. In either case, this is a single joint exercise, specifically, hip flexion. If you can do crunches on the decline bench, go for it. And if you can add a dumbbell or some weight to the mix, add the weight. However, be flexible to modify any exercise to one that is more comfortable. So, if flat crunches are easier, then do that. The point is, wherever you are in your fitness level, is the only place to begin. Just working out, moving your joints, every other day, your muscles are going to start to grow and you will start transforming your body. If you do not have time, do 2 sets of 10 crunches and make a note of it. In case you do not have time in the morning, see if you can slip in a 30 minutes moderate intensity workout as described in the section how to do HIIT cardio. Two days under your belt, give yourself another pat on the back. How are you feeling after two days of limiting refined and processed carbs? My guess is that after two days of no bread, pasta, donuts, or snickers, you are feeling pretty good. You might have seen some movement on the scale as well. In any case, for today, day 3 of the Fat to Fit Man Plan, you are going to rest for the most part. Do not lift any weights today. You are probably still pretty sore from the upper body workout on day one and the lower body workout yesterday. Rest from weight training today. However, start working on flexibility. Stretching and flexibility does not usually get too much attention. But, for a man over 50, flexibility is extremely important. You want to be able to move around, right? You know how you feel these days, a little stiff? Increasing your flexibility and range of motion for your joints is only going to make you a happier camper. A simple move to start the day with is called a static 90/90 hamstring stretch. Just lie on the floor, and lift one leg straight into the air at a 90 degree angle to the floor. Can you lift your leg 90 degrees or more? Or do you feel really tight after years of sitting at a desk? Hold the position of your leg for 30 seconds. Then jump on the cardio machine or into a pool and do 30 minutes of cardio before you eat. Weigh yourself and take a shower. My bet is that you have already taken off a couple of pounds. But remember, we are only shooting for weight loss of half a pound to one pound a week. Anything more than that is gravy and a bonus. We are focusing on building muscle and flexibility. How are you feeling after five days of consistent healthier eating? My guess is that you are feeling pretty good. Plus, you have two upper body workouts under your belt. You probably also notice that you are down a few pounds. Do not stress if you are not. The truth is that even half a pound to a pound a week is a great rate of weight loss. Since you did an upper body workout yesterday, today is either a full rest day or 30 minutes of HIIT cardio if you have time. Today is a lower body workout. This will give you 2 upper body workouts and 2 lower body workouts this week. It is actually amazing to think of how much you can transform your body with just 48 training sessions over 12 weeks. Just take it one day at a time and work the plan. If you eat right and consistent, and you train your muscles and ask them to grow with heavier weights, your body is going to change.